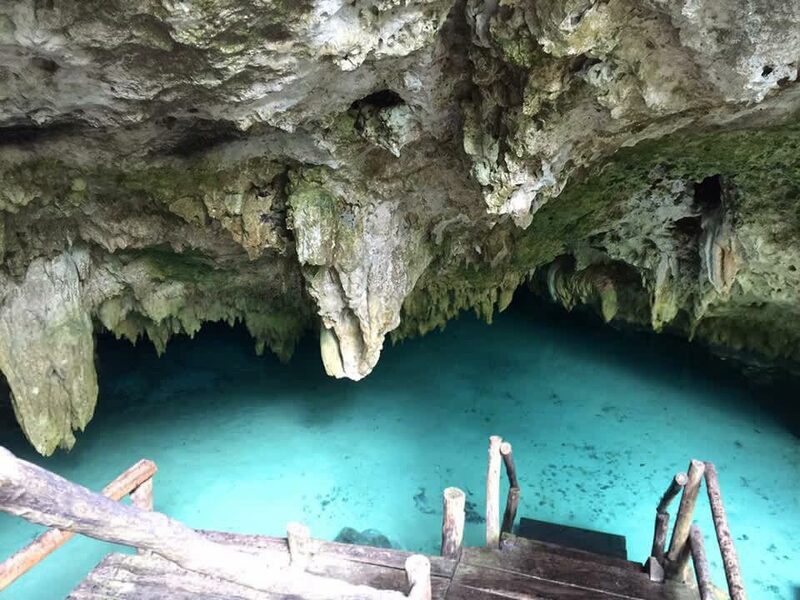 Cenotes located along the Riviera Maya are groundwater-filled limestone pits. Once a place for sacrificial offerings by the Maya, these beautiful swimming, snorkeling and diving locations are an exciting and memorable adventure to experience while vacationing in the area. The information below is intended as a helpful guide, details and fees are subject to change. 22 km south of Playa Del Carmen/Almost across from Puerto Aventuras. 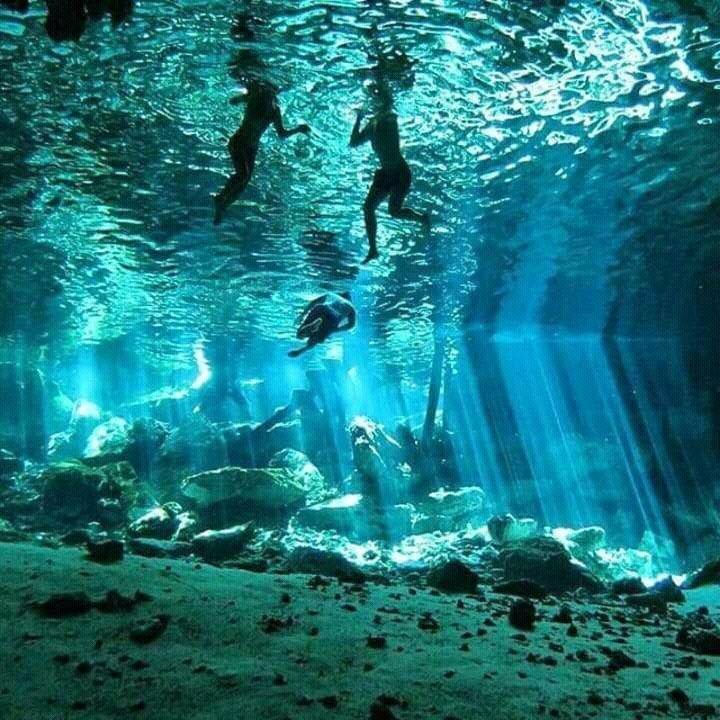 Two cenotes. Large cavern zone with beautiful views of jungle from inside cavern. Personal cameras not allowed, on-site cameras available for photo purchase. Exceptionally beautiful. 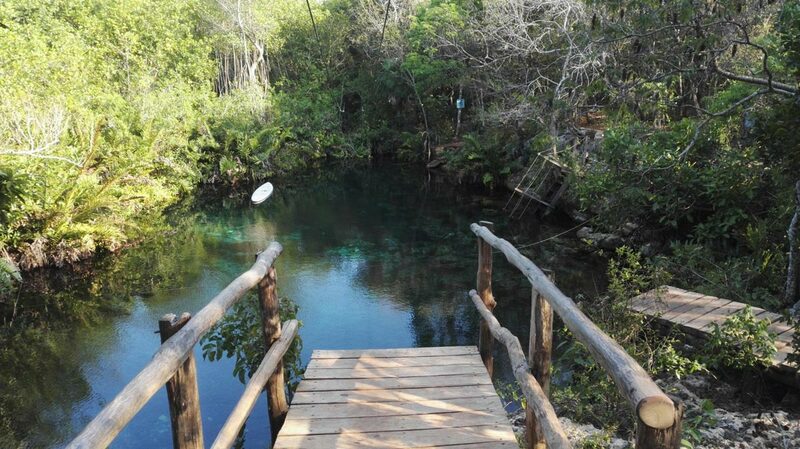 Short walk on path takes you to Coral Cenote, which has a large island in the center of it. Swimming: Very easy access. Nice overhang with tree that can be scaled to jump into cenote. Snorkeling: Excellent. 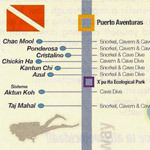 One of the most popular snorkeling sites. Unlimited visibility. Wide variety of fish, eels, turtles & aquatic plant life. 5 km south of Puerto Aventuras just before Xpu-Ha/Across from Barcelo Maya Hotel/Long way down bumpy road. Footpath through jungle will take you to some other cenotes - one is big & almost dry with lots of fossils. Swimming: Can swim through tunnel to underground air chamber. Entrance fee: $28 US Kayaks available for rent, restaurant, bike rentals, horseback riding, small zoo. 4 mostly half dome cenotes (Kantun Chi, Zaskaleen, Uchil Ha, Zazil Ha) along a series of light jungle trails. Most remote one has ancient looking Mayan temple next to it. Several tours stop here. Rental snorkeling equipment available. Just past Kantun Chi/Close to highway. Beautiful, very primitive & rarely visited. Good for hanging out. Will probably have place to yourself. Likely to see more locals than tourists. 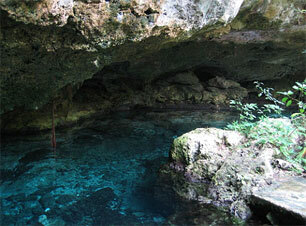 One can dive into cenote from 3.5 m (15 ft) tall ledge. Just past Cristalino Cenote/Close to highway. In light jungle setting with more open air/sunlit more than Kantun Chi, which creates more algae. Visitors are no longer allowed to jump off the roof. 26 km south of Playa Del Carmen/5 km south of Puerto Aventuras/Just south of Xpu-Ha. 4 interconnected cenotes. 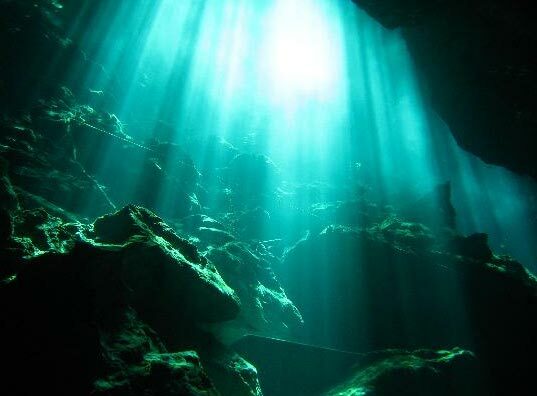 Snorkeling: Advanced - Requires swimming 5m underwater under a rock wall to come into a large open cave with that has light shining through from ceiling above. 48 km south of Playa Del Carmen/3 km south of Xel-Ha/On right 4 km down dirt road. Part of Nohoch Nah Chich cave system. Location of filming for Imax Journey into Amazing Caves documentary. Superb snorkeling. Very popular. Stalactites & stalagmites everywhere. 2 km from Tulum on road to Coba on right/Very rugged rocky unmarked jungle path approximately 50 yds from road. 3 holes in ground (one 30 ft & two 4 ft in diameter) create skull shape, hence the name. Shaded by thick jungle canopy. Great Swimming - 10 ft drop down into cenote. Rope swing & ladder - though you may want to bring your own rope just in case. 5 km from Tulum on road to Coba on right. 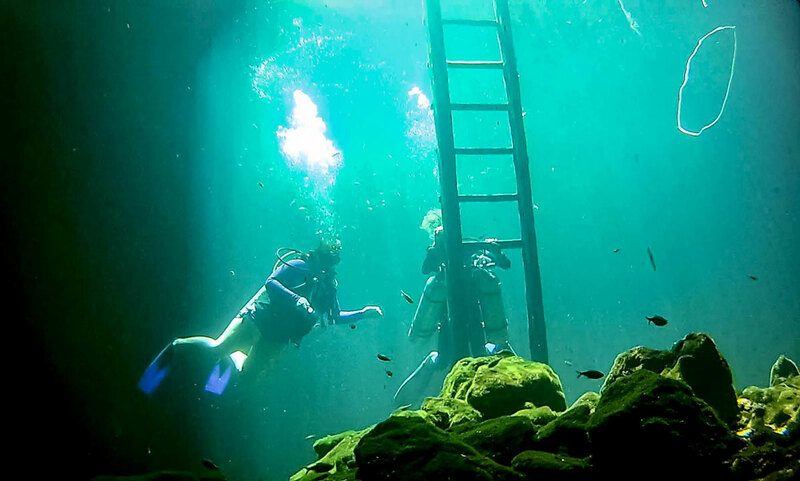 Ladder steps lead to half moon shaped cenote decorated with small passages & openings. One of most popular sites. Good for all ages. Shallow on one side/deep on other. Famous for brilliant speleothem decorations & crystal clear water. Fun snorkeling. Fantastic. Spectacular. Paradise. 8 km from Tulum on road to Coba/4 km past Gran Cenote on left. 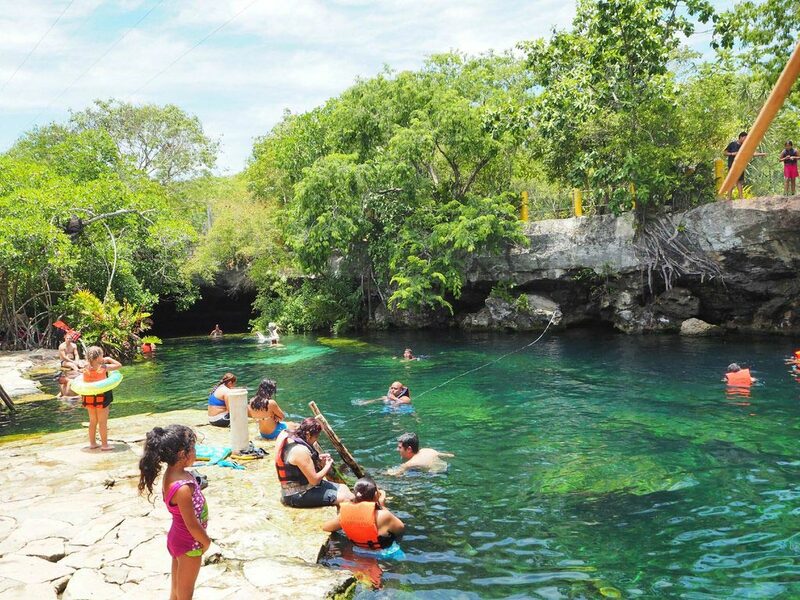 Can drive right in approximately 30 m (100 ft) to cenote & locals used to wash vehicles here, hence the name. Snorkeling: Good in winter months. Too much algae growth in warmer months. Many small tropical fish. Swimming: Very easy access. Like a small lake. Good. Fun. 4 km south of Tulum on right. Great swimming and snorkeling location. 4 km south of Tulum on left/Across from Cristal Cenote/2 km walk in Jungle. Tarzan & Jane style. Beautiful, crisp, clear, secluded. One of least known. Good swimming and snorkeling location. Some great stone formations. Located just north of Akumal is, Chemuyil, a small Mayan village home to many locals who work in Akumal and the surrounding areas. If you take a right off of the highway you can wind your way through town, and there will be signs for Cenote Xunaan-Ha. 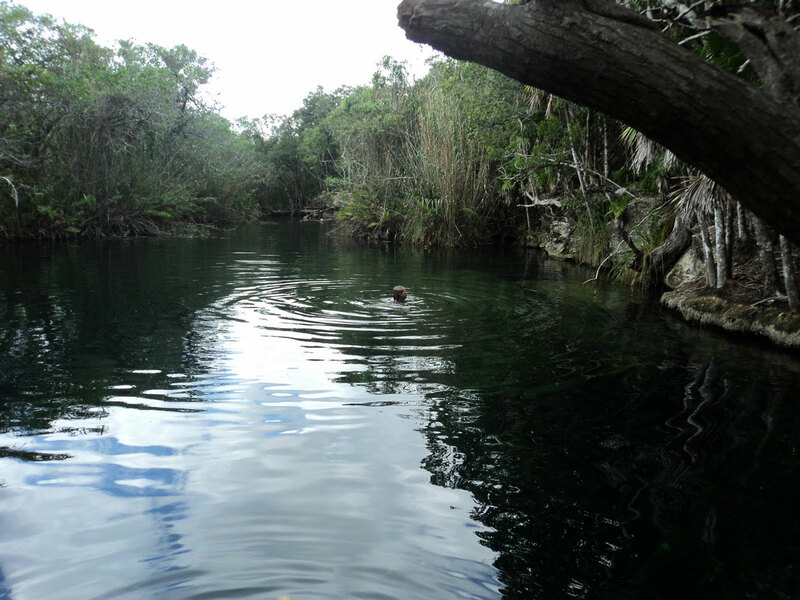 It is a small cenote off the beaten path tucked away in the lush jungle landscape. You can swim, float, or snorkel.. Don't forget to bring your mask; there are bountiful fish to follow, and an occasional freshwater turtle that will come out of hiding to tease you! Watch out for mosquitoes! Use of repellents is prohibited unless they are biodegradable (but none is best). If you stay in the sun, or the water, they don't tend to bother you. Heading south from Cancun on 307 just south of Puerto Morelos you will see a huge arch on your right hand side. 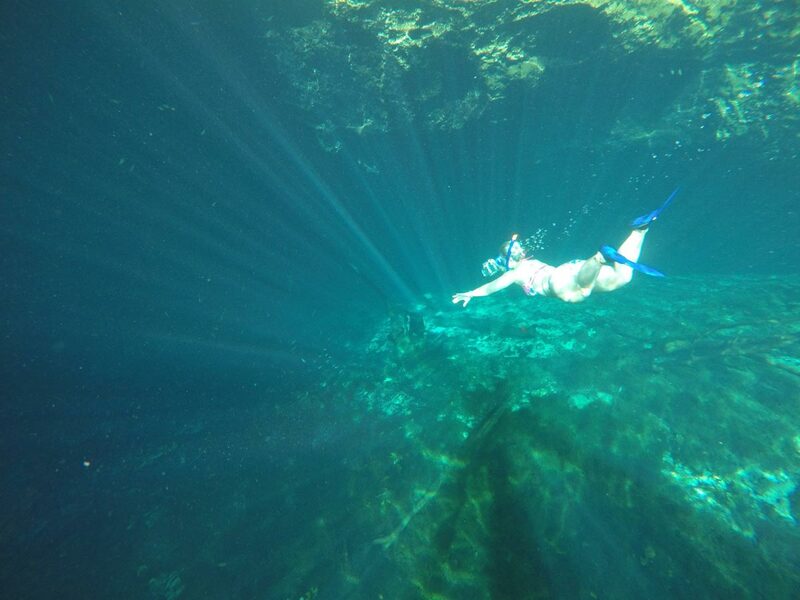 There will be signs for various cenotes, and if you are a freshwater lover this is truly heaven on earth. 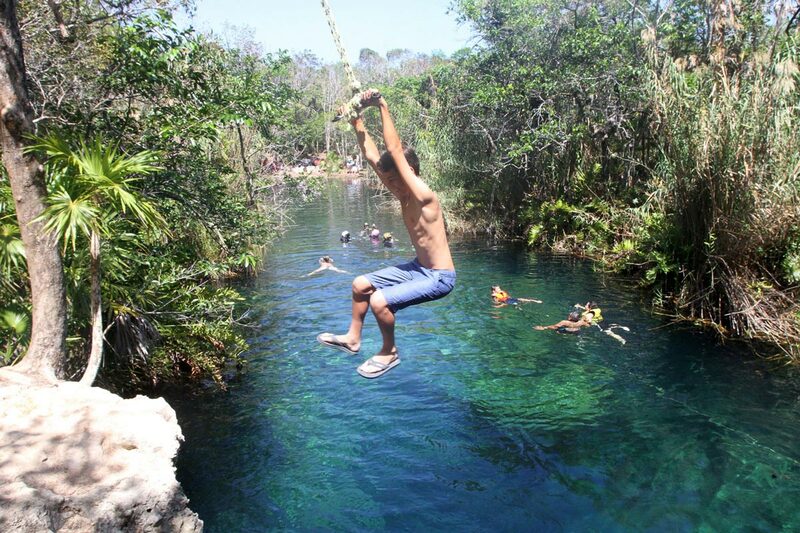 With over 100 cenotes scattered over the next 19 kilometers west bound there are many fun adventures to be had. 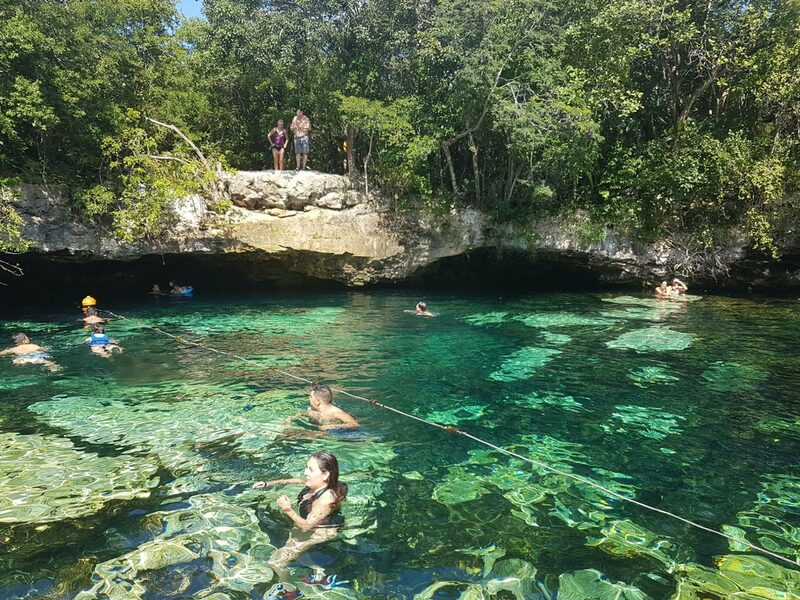 There are multiple spots along the way that have signs posted out front, and you can certainly venture out on your own and find some incredible cenotes. However, if you travel the 19 kilometers to Tres Bocas, you will surely enjoy the experience. Tres Bocas, meaning three mouths, is a ranch that has (you guessed it) 3 different cenotes. The first is located about 10 minutes on foot from where you are able to park. It is a great spot, with a shaded palapa area, an amazingly clean (and beautifully tiled) composting toilet, and a screened in palapa for camping overnight. There is also a Temazcal located on the property that is available for you to use. 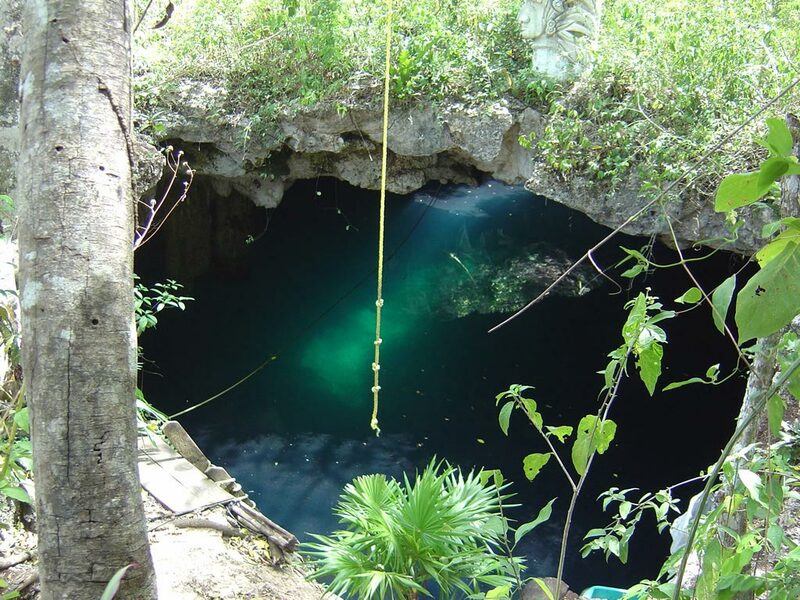 There are 2 other cenotes on the property, however, they are a bit of a hike in, and make SURE you have a competent guide with you. Hire a Mayan Guide. Tres Bocas is well worth the haul, and it is very rarely crowded so you get the place to yourselves. Located 20 miles south of Puerto Aventuras, and just north of Tulum, there is Cenote Manatee often referred to as Casa Cenote. 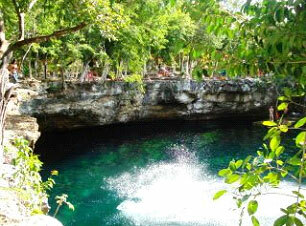 The cenote is located in a residential area called Tankha. There are signs for Casa Cenote on the highway that will direct you to the left hand turn off. 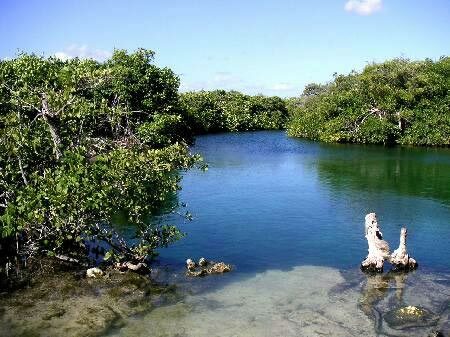 Once you drive through the residential area of Tankha you will come upon an open lagoon on your left (Casa Cenote). 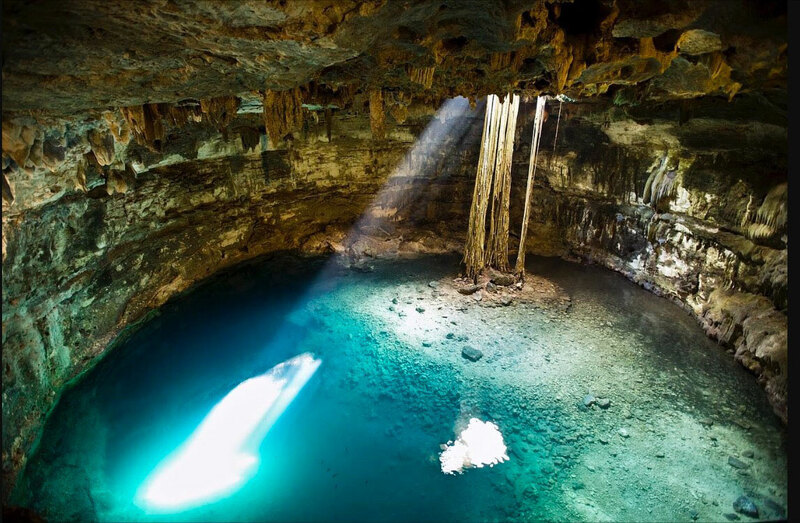 The Cenote is a large open lagoon that has a strong current. If you swim up the canal a bit you can float down as you snorkel and check out the freshwater fish and deep waters below. 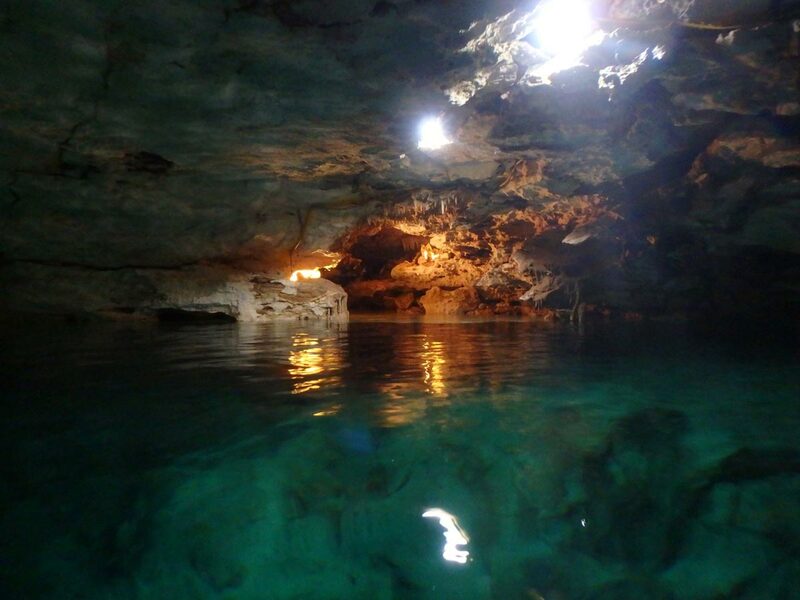 This cenote is used frequently by cave dive instructors to do skill drills and training. The freshwater flows under the road and when on the beach side you can experience the freshwater bubbling up into the sea which makes for fun currents, and a great variety of fish. There is a great restaurant Casa Cenote on the beach side which has great BBQ on Sundays. Right off the beach from the restaurant is great snorkeling with huge parrot fish, and massive schools of a variety of different fish.